Residents of cities, immersed in the hustle and bustle of the city, thinking about the rest, most often imagine some uninhabited sunny and sandy beach with palm trees. And the sea itself is associated with a state of serenity, joy, and peace. However, this is only one of its visions. Jose Antonio Sorolla, a Spanish artist, sees the sea and the people in a different way. 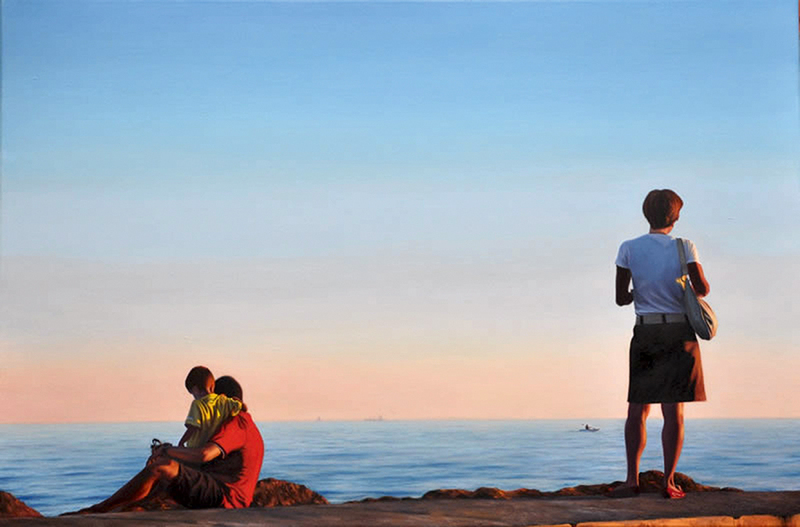 Recently, his hyper-realism style works were presented in Moscow Fine Art gallery. There is a character or characters in full-back position between us and all the details of landscapes on his paintings. Cloudy sky, calm sea – you can feel the coolness. We do not know whether these people are looking to the sea ripples, or look into the distance, or on the opposite shore of the bay. It is hidden. As if we have become unwitting spectators and caught these peoples for a walk along the sea. Even if there is someone who looks at us, his face is in shadow, and therefore also it does not express any emotion. And the illusory reality of the moment is achieved by meticulous painting details of clothes and items such as a bicycle, umbrella, camera. The use of close-up, combined with the finest glaze technique, masking the manual painting with brush on canvas, is an association with the cinema. The feeling of presence grows strong while viewing the series of pictures, on each one the same characters are in different moments of approaching to each other - the virtual movement in virtual superreality. Jose Antonio Sorolla is a pioneer in such a school of fine art, as hyperrealism. It arose in the U.S. in the late '60s, when artists showed extremely naturalistic stationary vehicles, billboards, pharmacy or shop windows, or reflects of the running city life. That’s why their work was absolutely deserted. By the end of the 20th century hyperreality resurfaced on canvas: new groups of postmodern artists take it on board. For example, Mel Ramos, Bernardo Torrens, Scott Pryor, that added humans and animals to the aesthetics of the 'classical' hyper-realism. Interest in the work of Jose Antonio Sorolla is one of the modern art trends, which tries to combine the most innovative schools and realism. The peculiarity of the artist is a set of colors, not specific to such a country as Spain. It would seem that, having been born in Valencia, Jose Antonio, like many Spanish artists, has to use the riot of bright colors. However, despite the fact that he was brought up in a family of artisans, whose business was manufacturing and painting clay pots, Sorolla entirely devoted his life to painting in soft colors. He had participated in exhibitions since 1983, presenting his work in numerous galleries in Europe and the U.S., as well as at art fairs, in urban exhibition halls and museums. Stopping by his sea paintings, you can wonder about the eternal, mourn the past, or fantasize about the heroes of his paintings near you. All the spectators will find their own meaning, but no one can deny the fact that they are attractive.